These scary Halloween invitations are pretty easy to make. 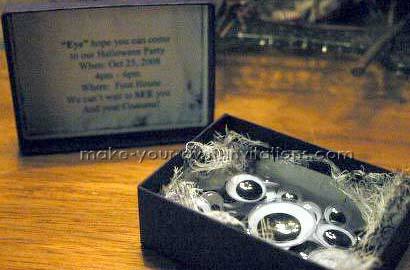 Sending your guests a box full of creepy eyeballs is definitely a fun way to invite them to a party. 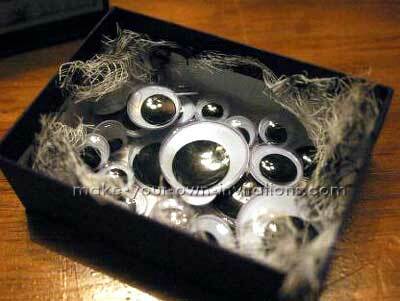 Imagine the looks on their faces and the fun the kids can have playing with their fake eyeballs. Take the cheese cloth and stain it with the brown ink, you might try red colored pigment for a bit of blood. Line the box with the cheesecloth. Measure the inside of the lid and create your invitation wording on your computer to fit. Print, age it with tea or distress it with ink and glue to the inside of the lad. Put the lid on the box and send it off to your guests. you may wish to hand deliver your invites. For this kind of invitation we used wording and repeated the word 'eye' a lot.